On December 12, 2017, Eric Dubay's YouTube channel was shut down. This happened after he uploaded a video about him being censored for his views on Hitler and the very next day JewTube terminated his account. YouTube is no longer a platform for free speech but is now just as controlled and slave like as our slave jobs and indoctrination camps. Eric I wish the best for you and I hope you can overcome this and I will help support you and spread the truth. Eric has created a new YouTube channel to use and his websites are still available and up. This was an attempt to censor Eric for not just exposing how YouTube was censoring truth channels but how they were censoring a specific video titled "Adolf Hitler vs the Jew World Order." Eric has been a researcher for years now and this is not the first time there has been attempts to censor him. About over a year ago, his website ifers.boards.net and atlantean conspiracy were shut down online or as he titled it "banned on the internet." A couple of months ago at about July of 2017, he made a video called "YouTube Covertly Censoring Truth Channels" which included hundreds of comments of people stating that they were reportedly "unsubscribed without their knowledge" or that their likes on the videos didn't count. YouTube has officially shown their true colors and we will not back down! 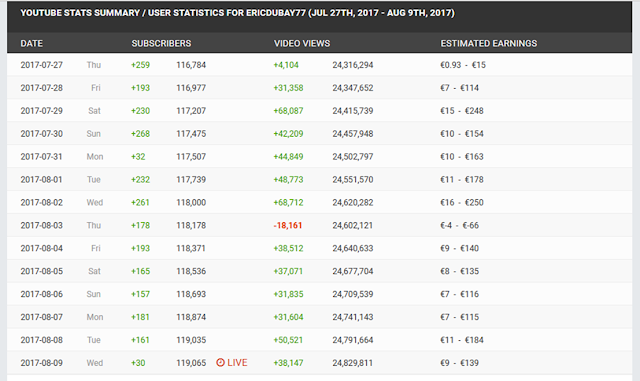 On Eric's website "AtlanteanConspiracy.com", he posted on July 21, 2017, "YouTube is actively working to censor flat-Earth and other truth channels/content. I have received several fraudulent copyright strikes from BBC and other establishment organizations in an attempt to censor me. I have had several videos exposing the truth about Hitler and the holocaust blocked world-wide. Now YouTube's latest tactic is to unsubscribe my subscribers from me! I have hundreds of subscribers telling me the same story. Not only are they unsubbing people from my channel but active subscribers are not receiving notification of my new uploads in their feed. Even after clicking their new stupid bell icon to "receive all notifications" many have said they are still not seeing my uploads in their account. So please be sure to check back often and make sure you are still subscribed and getting notifications on all your favorite truth channels! Please help like, share, download and re-upload my videos to help spread the word about these most important, highly censored subjects!" "Further proof of YouTube censoring Flat Earth and my channel specifically has surfaced. Using SocialBlade's real-time view counts of my YouTube channel a soft-censorship of my view-count is apparent. While they could very well be bringing 80,000 daily views to 40,000 without anyone knowing better, on August 3rd they messed up and removed so many views from my channel that it resulted in my account receiving NEGATIVE -18,161 views!"